With double with flowers ‘Elegans Champagne’ tops things off with a ruffled pale cream anemone centre. A very elegant looking flower that contrasts well against the deep green foliage. This is a Camellia japonica type, and as such is best in a part shaded position. The flowers are naturally attractive, however for the largest flower size ‘Elegans Champagne’ is best when disbudded. This simply means pinching out some of the flower buds to give the biggest buds the best chance of performing at their best. Easily grown in the garden border, or as a feature plant. also suited to growing in containers in a shaded courtyard. Like many of the white flowering camellias, we prefer to grow ‘Elegans Champagne’ in a protected position. The shade of larger trees, or beneath the eaves of a building are perfect. A humus rich well drained soil, slightly on the acidic side is best. New plants should be watered in well, mulched and watered well through the first few summers. A specialist camellia fertiliser in spring will promote good growth. Prune regularly to maintain a good bushy habit. 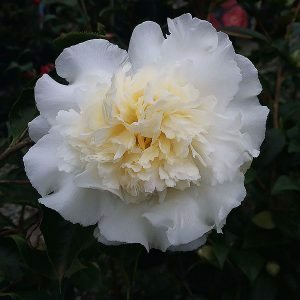 Like all camellias, ‘Elegans Champagne’ can be pruned fairly hard if required. Flowers – White, double with a cream centre. Drought tolerant – Medium once established in a good soiled position.